Urban Simplicity: What is it? So today the local Jewish Community Center had a bomb threat. It was one of 10 JCCs across the country today, and dozens in the past few days, that have had bomb threats. I've been a member of this JCC for the past 15 years. I was there swimming yesterday. They--the workers and the members--are incredibly beautiful people. Over the years I've made friends with many. Two nights ago, on a corner that is just one block from my home and next to one of my favorite watering holes, two young men were beaten simply for being gay. Islamophobia is on the rise, this can not be denied. I work with a few Muslims and they are hard working and so very friendly. I cannot imagine having hatred towards them simply because of their faith. What is it? This hatred. Where does it come from. People are not born hating, they are taught it. But why? What is it? It stems from fear, I am convinced of it. We are all just people. No matter our color, faith, or sexual orientation, we are just people. 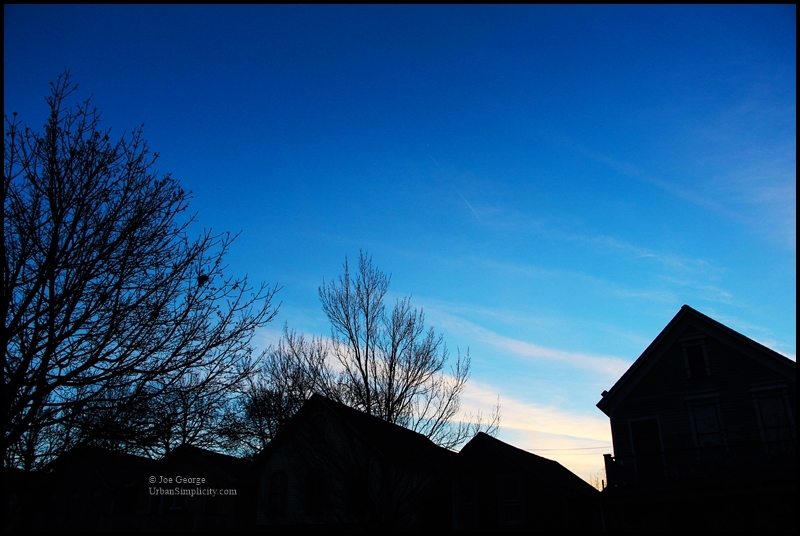 The above photo was taken at dusk this evening from my front porch. A beautiful evening. The temperature today hit the upper 40s Fahrenheit. It's supposed to be like this all week. By the weekend it is supposed to hit 60F. This is Buffalo, NY in February where it is normally frigid and snowy. But it's the hate that occupies the news. Climate change does not know borders, race, or religion, but it is happening. I can't change the big stuff but I can do small things. We all can. And that's what I need to focus on. The good stuff, no matter how small. To answer my own question...the good stuff. That's what it is. Because light and good always overcomes darkness. But I'm rambling now. Anyhow, this is what I was thinking as I stared at the sky on an incredibly beautiful yet really unseasonably warm February evening. I'll get off my little soapbox now. "My faith demands that I do whatever I can, wherever I am, whenever I can, for as long as I can with whatever I have to try to make a difference."